Firefox once a popular browser among net savvy users lost some of its charm to Google Chrome, thanks to some of the useful features in Google Chrome like new tab page features. Firefox home tab and new tab page are going to get new features in Firefox 13 builds, initially Extremetech reported that these features will come in Firefox 12 to be released in April this year. The new tab feature is similar to what you find in Google Chrome new tab page and the home tab of Firefox will be revamped. The new tab feature in Firefox will display a 3×3 thumbnails of sites you visited. The default view shows the most visited sites but you can change those thumbnails either by drag and drop to change the order or hide some of the sites. 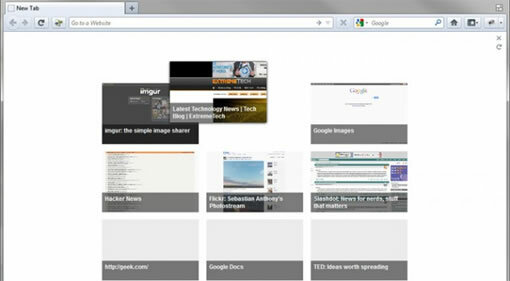 You can also pin thumbnails of your favorite sites to the new tab page. 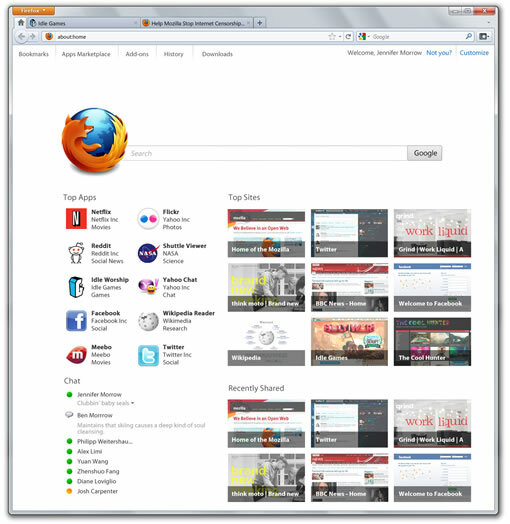 Along with the new tab page Firefox home tab will be revamped. Home tab will carry one click links to downloads, Firefox bookmarks,Â settings etc. Along with these it will get an app centric approach like Chrome with links to favorite apps, recently visited sites, shared sites, and Google talk client integration right into the Firefox home tab. Firefox will also get URL auto completion feature like chrome. Firefox 12 is slated for an April release, these new features may not make it to the Firefox 12 and might come with Firefox 13 which might be released somewhere in the mid year. Check out addons to manage Firefox tabs.